Newark, NJ (May 2, 2016) – Have you ever wanted to be a part of something great? Well here’s your chance! 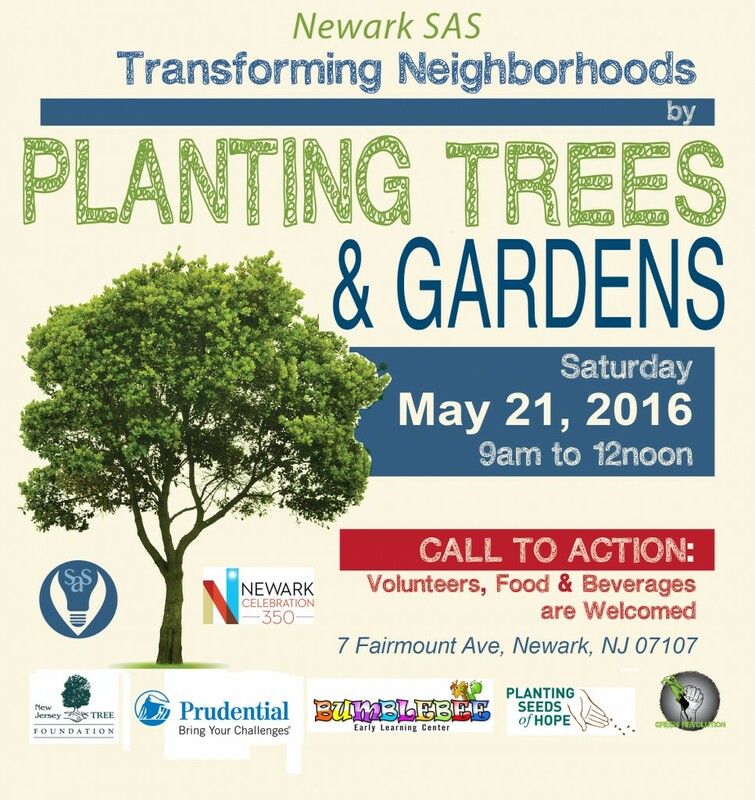 Newark Science and Sustainability, Inc. (“Newark SAS”), located in Newark, New Jersey, has partnered with the NJ Tree Foundation’s Renaissance Trees Program and Prudential Financial, Inc. on a community greening project scheduled for Saturday, May 21, 2016. Other collaborating partners include Planting Seeds of Hope, Bumble Bee Learning Center, and Green Revolution Sustainability Consulting. The event will begin at 9:00 a.m. inside of the Garden of Hope, located at 7 Fairmount Avenue, Newark, NJ 07104, with the planting of 350 plants, a variety of produce, herbs and edible flowers, to commemorate Newark’s 350th year celebration. In addition, 16 trees, including 2 fruit trees, will be planted in this neighborhood. This event will serve as a means to encourage healthy eating, healthy living practices, and environmental education. Volunteers and refreshments are welcomed. Celebrating the Renaissance Trees Program’s 10th year in Newark, the NJ Tree Foundation will provide the trees, tools, gloves, and water, while Prudential will be donating 350 plants and organizing employee volunteers. Taking the approach of social entrepreneurship, Newark Science and Sustainability, Inc. is a community-driven, 501c3 nonprofit organization that strives to assist with the creation of self-sustaining communities by developing pathways for green jobs that contribute to self-sufficiency and community empowerment. Newark SAS also implements various initiatives to increase awareness of environmental issues through educational programs and hands-on training which you can engage in by visiting our website www.sasglocal.com. The NJ Tree Foundation is a statewide nonprofit organization dedicated to planting trees in New Jersey’s most underserved neighborhoods, where the need is greatest. Through tree planting, volunteerism, and partnerships, the NJ Tree Foundation assists numerous communities in improving their environment and quality of life. Since its inception in 1998, the NJ Tree Foundation has planted 203,661 trees across the state. Learn more at www.njtreefoundation.org. Prudential Financial, Inc. (NYSE: PRU), a financial services leader with more than $1 trillion of assets under management as of December 31, 2015, has operations in the United States, Asia, Europe and Latin America. Prudential’s diverse and talented employees are committed to helping individual and institutional customers grow and protect their wealth through a variety of products and services, including life insurance, annuities, retirement-related services, mutual funds and investment management. In the U.S., Prudential’s iconic Rock symbol has stood for strength, stability, expertise and innovation for more than a century. For more information, please visit www.news.prudential.com. Posted in Blog, Community Gardening, Glocal, Sustainability, Urban Agriculture and tagged Community Gardening, Environmental, Sustainability, Tree Planting, Urban Ag.